The IDC flat ribbon cable connector system provides a reliable and cost effective modular approach to electronic interconnection. 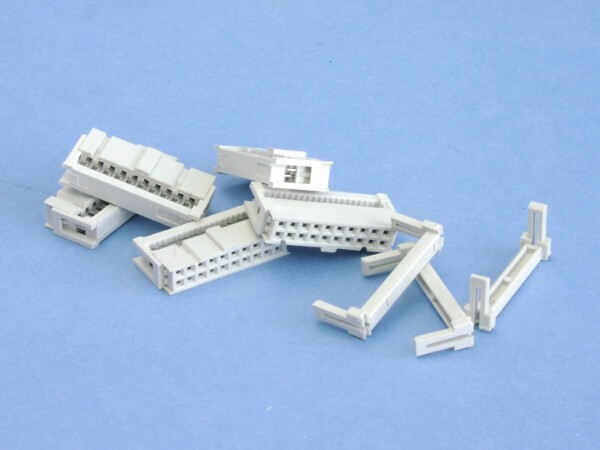 The flat ribbon cables used with this connector range have 10 to 64 (28AWG) conductors on a 1.27mm pitch. Insulation displacement contacts (IDCs) allow a ribbon cable to be forced onto sharp tines on the back of the contacts; this action pierces the insulation of all the wires simultaneously. This is a very quick means of assembly whether done by hand or automatically. The modular design of headers, sockets, etc. offers a very reliable mass termination and cost effective approach to interconnecting PCBs, or wire-to-board, separable header/socket or dual-in-line applications. Shrouded headers provide a polarised guide for mating socket connectors. Locking ears provide latching for mated pairs plus they can also act as ejectors for unmating when required. Outstanding features of this ribbon cable connector are high contact reliability, long life and low contact resistance. Satisfies the requirements of BT224, BS9525 F0023, BS9525 F0026, MIL-C-83503 and DIN 41651.